Sought after North Scottsdale gated community with only 23 custom homes, removed feeling with convenient access to 101 with shops, restaurants, hospitals and more. Enjoy seamless indoor/outdoor living with amazing McDowell and Pinnacle Peak mountain views from this elegant estate. Desirable split bedroom plan with generous master suite, 2 ensuite bedrooms plus large den, and 1000 sq ft private entry guest residence with full kitchen. 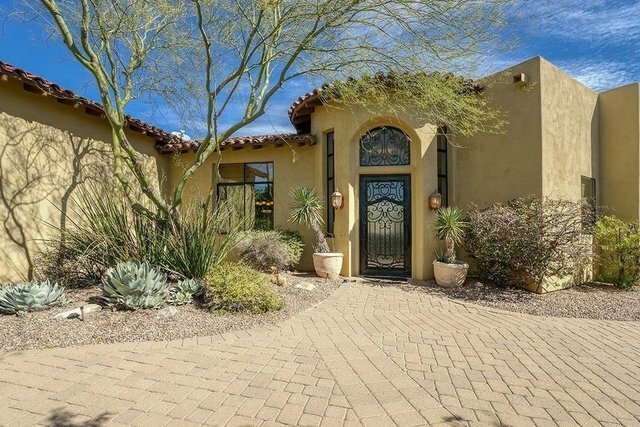 Expansive family room with full wrap around bar opens with large glass doors to enjoy majestic mountain views generous outdoor living space with covered patio, pool, spa and natural desert landscape. Entertainer's kitchen with substantial eat-in island, classic cabinets and granite countertops, 5 burner gas cooktop, double ovens, built in desk, and shares charming courtyard with guest residence. Timeless finishes throughout including hardwood and travertine flooring, natural marble tile accents, shutters and remote window shades. A hidden jewel in the desert!